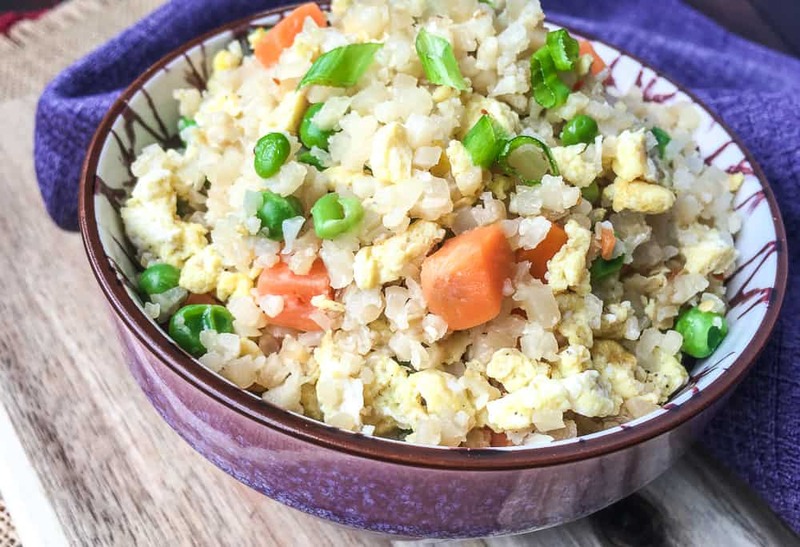 Low Carb Cauliflower Fried Rice is a healthy and versatile recipe that is full of great flavor. If you, like so many of us, have committed to taking better care of yourself this year, this recipe will soon become one of your favorites! If your “taking better care” resolution includes making better food choices, you may think that means eating nothing but bland, boring foods that don’t exactly excite the taste buds. But wait! Don’t despair and don’t give up hope on still being able to eat yummy, satisfying foods. 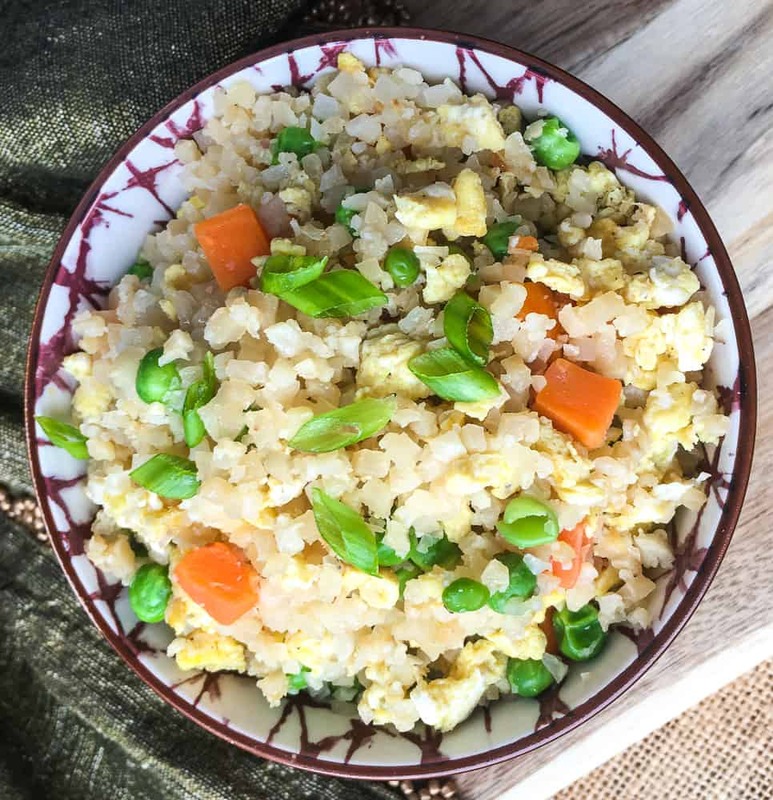 This recipe for Low Carb Cauliflower Fried Rice is proof you can eat healthily, uphold your resolution and still absolutely love what’s on your plate! It is healthy and guilt-free! Cauliflower has several health benefits. It is high in fiber; low in fat. It also contains awesome quantities of Vitamin C, Vitamin K, and Vitamin B6. Plus it has healthy doses of potassium, manganese, folate, and magnesium. It is an all-around great choice for the healthy eater you have chosen to become! You can still indulge in your favorite Chinese food flavors. When you vowed to eat healthier foods, I am sure you crossed Chinese food right off the list. 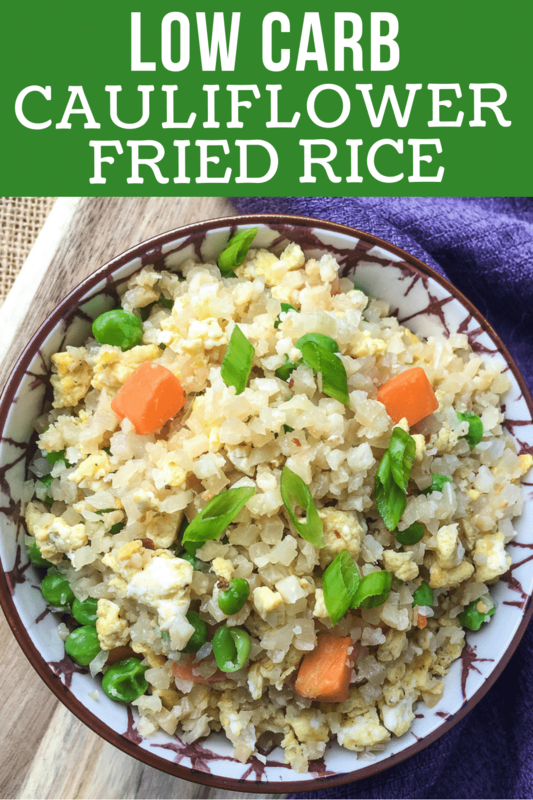 But with this Low Carb Cauliflower Fried Rice recipe you can put it right back on there! I love Chinese food, and I especially love fried rice. So luckily, this recipe totally satisfies my urge to indulge while leaving the fat, calories and guilt behind. Because it is so simple to make! You can now buy riced cauliflower in most grocery stores. The peas and carrots are all set to go as well. The only slicing and dicing you need to do is a few green onions and a bit of ginger. The rest is just adding, stirring and cooking. Super simple. Heat one tablespoon butter in a wok or large high-sided skillet over medium-high heat. Add eggs and season with salt and black pepper, to taste. Cook, stirring constantly, for 1-2 minutes or until eggs are cooked through. Transfer eggs to a plate and set aside. Next, add in the remaining butter, frozen cauliflower, peas and carrots, green onions, fresh ginger, garlic powder, and red pepper flakes. Season with salt and black pepper to taste. Cook, stirring constantly until frozen veggies are heated through and tender, approximately 5-6 minutes. Then add in tamari sauce (or coconut aminos) and sesame oil, and then put the scrambled eggs back into the wok or skillet. Cook for 1-2 minutes, stirring constantly, or until all ingredients are thoroughly combined and heated through. Remove from heat, top with additional green onion and serve immediately. Enjoy! Tired of salad, but want something along the same lines? Check out this Broccoli Keto Slaw recipe. Yummy! Just like cauliflower easily replaces grains like rice, spaghetti squash is a great substitute for pasta. Don’t believe it? Try this Instant Pot Spaghetti squash. So you’ve tried the Cauliflower Fried Rice and are now a cauliflower rice convert. Then you will love this recipe for Pickle-Braised Chicken Thighs with Cauliflower Rice. Add remaining butter, frozen cauliflower, peas and carrots, green onions, fresh ginger, garlic powder, and red pepper flakes. Season with salt and black pepper, to taste. Cook, stirring constantly, until frozen veggies are heated through and tender, approximately 5-6 minutes. 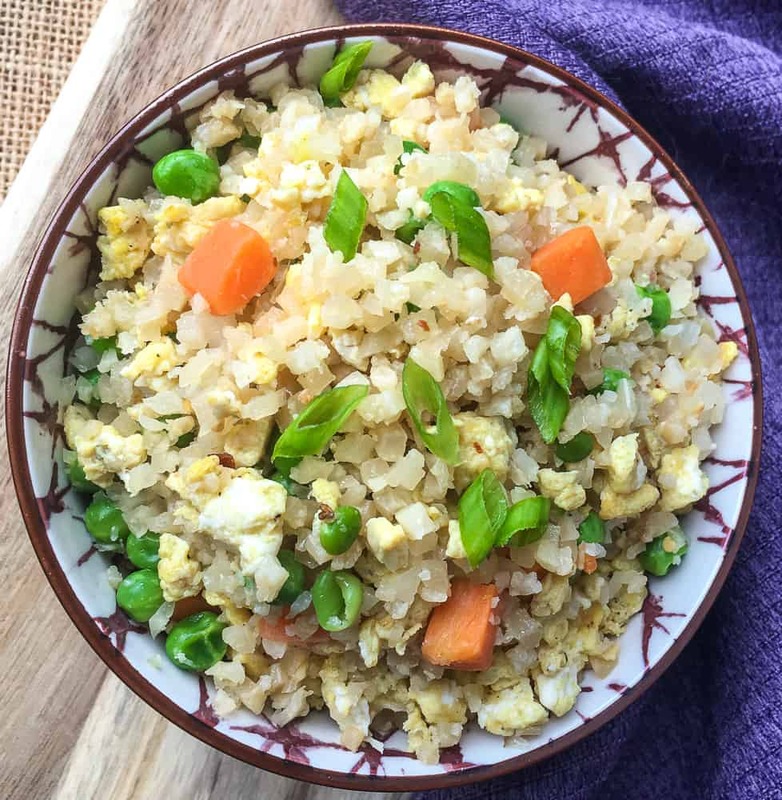 Add tamari, sesame oil, and scrambled eggs to the wok or skillet. Cook for 1-2 minutes, stirring constantly, or until all ingredients are thoroughly combined and heated through. Remove from heat and top with additional green onion, if desired, and serve immediately. Enjoy!